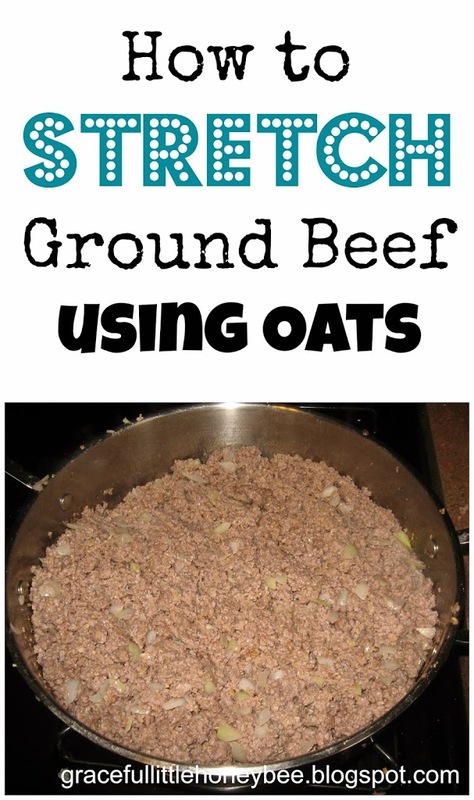 Did you know that you can make your grocery money stretch by adding oats to ground beef? I promise you it tastes the same and no one will know the difference. I do this every time I cook ground beef and it saves me lots of money. First off I normally buy the 5lb family pack of ground beef at Aldi to save money, but this time they were out so I had to buy the 2.25 lb pack. 1. Mix all ingredients until well combined. 2. Brown ground beef as usual. *Note: The oats soak up a lot of the fat so you will need to stir often to avoid burning or sticking to the pan. Use your beef mixture like normal! I normally let mine cool and freeze for later use. As you can see I got 4 “lbs” of ground beef out of my 2.25 lbs! Yea baby! I’ve also heard that you can stretch ground beef using lentils, rice, beans and/or pureed veggies, but I’ve never tried any of them. Do you do anything to stretch your ground beef? If so I’d love to know your secrets! Can you use it with ground pork? I make Tourtiere during the Christmas/New Year's holidays like every French Canadian. So delicious. I'm sure ground pork would work, although I haven't tried it. Taco Bell ground beef is largely oats believe it or not. I worked there and it's a listed ingredient on the box.